Published on 14 September 2012. 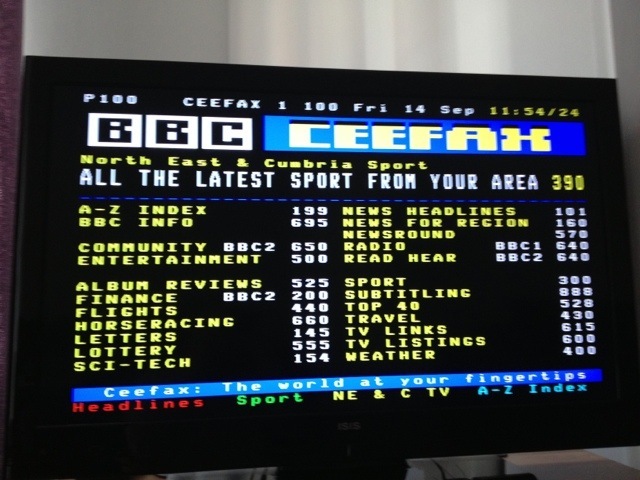 Tyne Tees is one of the few areas of the UK where Ceefax is still available… but not for much longer! In 12 days, this region will complete digital switchover and we’ll lose Ceefax forever. The degree to which this really doesn’t matter to me personally is exemplified by the fact that it’s taken me about 10 minutes to work out how to get it on my current TV…! But I used to use it quite a lot, so I feel a little bit sad to know that it will no longer be there! This 1,809th post was filed under: Media, Photo-a-day 2012, Technology.